Maui’s not the best place to suffer a serious illness or health problem. There is one major hospital, Maui Memorial, which is the brunt of many jokes and bad hospital stories here. When people survive a procedure at Maui Memorial, they post it on Facebook, and their friends comment with sighs of relief. There is Kula Hospital, but it’s even smaller than Maui Memorial. When people have a serious accident that can’t be treated on Maui, they are flown or helicoptered to Oahu to get major surgery. Or they go to the mainland. A neighbor got knee surgery on Oahu. Accident victims from a car going over a guard rail down a steep drop off were flown to Oahu for intensive care. Passengers from a head on collision had to be treated on Oahu for multiple injuries. One family moved from Maui to get specialized cancer treatment, and a friend got cancer surgery on the mainland. 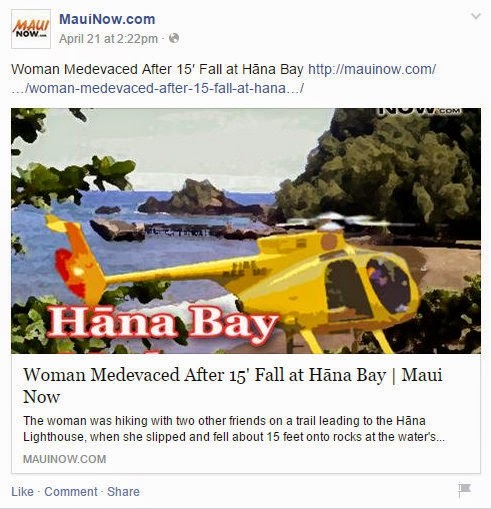 People get medevaced to Oahu all the time. If you have a progressive, debilitating disease that requires ongoing care, Maui doesn’t have the specialists to take care of you. There might be only a handful of specialists, for any particular body part or disorder, like gastroenterology, pulmonology, endocrinology or even dermatology. 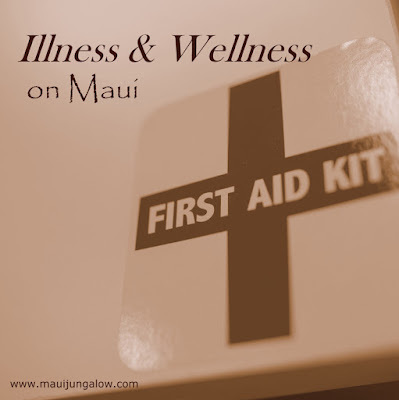 There might be a long waiting list to see that person, and if you want a second opinion, you might not get it on Maui. If your teeth need special care, there aren't that many endodontists here either. On the other hand, say you have a terminal illness, and medical science has declared that they cannot treat you and if you will die in a year, then Maui’s a great place to be. Unless you cannot take care of yourself and must live in a nursing home. If so, you don’t have a lot of choices, and nursing homes here will be so much more expensive than almost anywhere else in the country. As an aside, there is one affliction that does happen to some people who move here. It’s not homesickness. It’s called “haole rot” and is kind of like athlete’s foot for the rest of the body. Often it occurs when the weather is very humid, and people were sticky clothes like swimsuits and their skin doesn’t get to dry out. It’s nicknamed for Caucasians, aka “haoles” who may not be used to the Hawaiian microflora. If you’re already healthy and want to stay healthy or get more healthy, Maui offers a dizzying array of healing retreats, spas, workshops, colon therapy, new age healing practices, health and nutritional sessions, personal trainings, therapeutic massage, acupuncture treatments, and yoga classes. You can get detoxed, have your colon cleaned out, learn to make gourmet raw food cuisine and get your chakras and personal aura realigned! Hopefully not all at the same time. Hi! Sure glad I didn't get sick last year when my husband and I visited beautiful Maui. We did have a bad rental car that sounded mechanically unsound. We took it back. Now really glad we did. Thanks for visiting my blog, Courtney. Your blog banner is beautiful. Hi Courtney, I'm so looking forward to checking out your previous posts as well, and keeping up to date with your A-Z.. the spas et al sound wonderful and of course from previous postings I can only imagine the beauty of Maui seeing your beautiful photographs. Hope this finds you well and have a lovely weekend! Dropping by on a return visit you paid to my blog Let's Get Out of Here! Returning the follow as well! Proud to be your #97!